With no fixed panes and blades that open almost fully horizontally (87 degrees) Altair Louvre Windows welcome fresh, cooling breezes yet seal tight when closed. A variety of energy efficient glazing options are available to meet local requirements. Energy ratings of most windows sold in Australia can be found in the Window Energy Rating Scheme section of the WERS website. With no fixed panes and blades that open almost fully horizontally (87 degrees) Altair Louvre Windows welcome fresh, cooling breezes. These cooling breezes reduce the need for power hungry electric air conditioning systems, thereby helping to save our fragile environment. External screens deliver additional insulating and shading benefits to Altair Louvre Windows. The Easyscreen Altair Louvre Window is the only window system currently energy rated under the Window Energy Rating Scheme (WERS) with permanent, externally fitted metal mesh screens. WERS ratings of screened products can be found at their website. 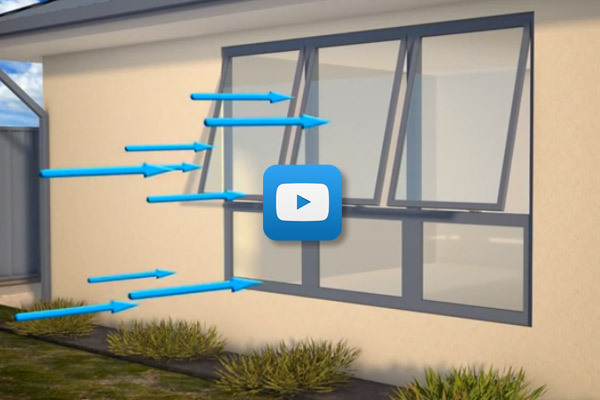 The secondary glazing configuration of the Dualair System results in significant improvements to the thermal insulation of Dualair Window Systems due to the large air gap. Breezway offers three formal CPD tutorials to Architects & Designers on Fall Prevention, Ventilation and AS2047 and AS1288. These have been accredited by AIS. Book today and collect your CPD points! A variety of energy efficient glazing options is available to meet local requirements. For example, in cooling climates toned glass blades or timber blades reduce the amount of hot sunlight that enters a building. In mixed and heating climates, the improved insulating properties of low e glass blades offer thermal performance comparable to clear double glazing. Altair Louvre Windows are the only energy rated louvre windows. Energy ratings of most windows sold in Australia can be found in the Window Energy Rating Scheme section of the WERS website. In warm climates where “cooling stars” are the major consideration, the shading offered by tinted glass or timber blades have a positive impact on the window’s energy rating. The energy efficiency requirements of the National Construction Code (NCC) are contained within Section J of Volume One and Part 3.12 of Volume Two. The complex interactions between the energy efficiency characteristics (U-value and solar heat gain coefficient), the size, the shading and the orientation of each window for each of the climate zones and for the various building types are expressed within extensive formulas and tables. The Australian Building Codes Board makes excel spreadsheets, known as ‘Glazing Calculators’ available on their website (www.abcb.gov.au) into which the data can be inputted to assess compliance. These glazing calculators make it easy to assess the impact of changes to the glazing, the window sizes or the window shading devices. Analysis using the glazing calculators shows that Altair Louvre Windows can comfortably comply with the energy efficiency requirements of Section J and Part 3.12 in all climate zones, with high window area to floor area ratios possible in most climate zones when appropriate glazing and shading are used. More information can be found by viewing the documents below. To learn more about an easy way of comparing the U-values of Breezway windows with both louvre and fixed bays to the U-values of other window types, please read the Breezway Technical Bulletin below.